LIMA, Peru (AP) -- A leftist former army officer who nearly won Peru's presidency five years ago with fiery anti-capitalist rhetoric and open affinity for Hugo Chavez has surged into contention once again, leading opinion polls ahead of April 10 presidential elections. To get there, Ollanta Humala ditched his leftist discourse and radical red T-shirt and distanced himself from Venezuela's president, pitching himself as a mellowed moderate. But is the makeover merely cosmetic? Although Humala frequently dons a suit and tie and does his best to appear a modest, respectable family man, the business community is spooked. It fears that if Humala were to win, he would scuttle an economy that grew nearly 9 percent last year and is the envy of many neighboring countries. Lima's main stock market index dove more than 5 percent earlier this week after polls showed Humala in the lead for the first time, reaching a technical tie for the lead with Keiko Fujimori, daughter of disgraced former President Alberto Fujimori. A new Datum poll released Friday, gave Humala a de facto lead with 21.4 percent. Closely clustered behind him were Fujimori (16.4 percent), former President Alejandro Toledo (17.4 percent) and Pedro Pablo Kuczynski 17.5 percent), an economy minister and Cabinet chief during Toledo's 2001-2006 presidency. The poll's error margin was 2.2 percent. Another new poll by the Catholic University gave Humala a clearer lead over Toledo, who had been the front-runner since January. Humala was up by 24.3 percent to 18.8 percent, with a margin of error of 2.3 percent. Toledo had been leading the race since January. Humala summoned reporters to a hotel in Lima's wealthy San Isidro district after Monday's market drop to assure them his economic policies would "respect our international agreements." "Nothing will be done outside democratic, legal means," he added. Earlier in the campaign, the former army lieutenant colonel had called for renegotiating Peru's free trade agreements. Humala also is promising to respect Peru's constitutional prohibition against immediate re-election, a clear acknowledgment of fears he might mimic Chavez and the Venezuelan president's close allies, Presidents Evo Morales of Bolivia and Rafael Correa of Ecuador. All three won re-election after voters passed referendums allowing the countries' charters to be rewritten. All three also have been accused of using strong-arm tactics to silence opposition-run news media. Humala says he respects freedom of the press. 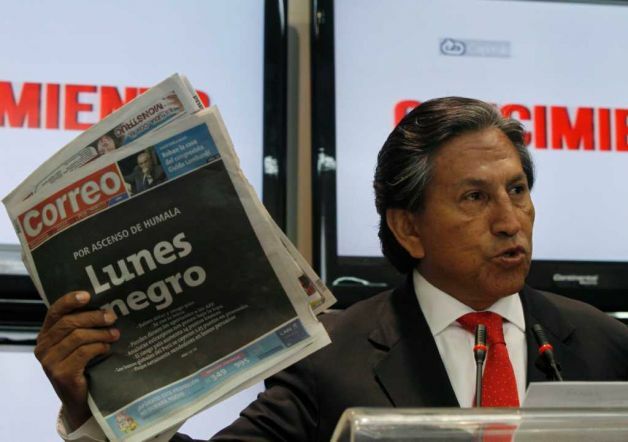 But Peru's dominant, business-friendly daily, El Comercio, has shown little respect for him. Last week, it likened Humala's plans for the economy to those that wrought economic ruin in eastern Europe under Soviet rule. While short on specifics, Humala has advocated expanding the state's role in the economy and extracting higher royalties from mining companies, which account for 60 percent of Peru's exports. Toledo also proposes higher taxes on windfall profits by mining companies. But he and the other three leading candidates also believe the private sector should continue to play a dominant role. In his 192-page campaign platform, Humala strikes a markedly different tone from the others, contending that Peru has become "the instrument of a few small (business) groups who consider their transnationalization the only road to development." Humala told business leaders in a January speech that he'd seek to rewrite the constitution to create "an economic regime that has social justice as its objective." That, he said, includes "restoring national sovereignty over ... natural resources." He insists, for one, that the natural gas needs of Peru's people take priority over exports, echoing rhetoric that helped Morales get elected in gas-rich Bolivia. Playing on class resentments in a nation where 34 percent of the people live on less than $2 a day, Humala says Peru's economy still depends too much on the cheap labor of its poor, poorly educated indigenous majority. That has played well in the largely destitute central and southern highlands, where people whose first language is Quechua or Aymara have barely benefited from the decade-long boom produced by higher mineral prices. Humala's climb from fourth place in January, when just 10 to 12 percent of voters preferred him, is a reflection of what independent political analyst Julio Cotler calls "the classist vote" in Peru. "It's a vote that seeks the redistribution (of wealth)," he said, through such vehicles as state-supported day care, guaranteed pensions and inexpensive natural gas. "They are old causes that I consider to be perfectly valid." But diametrically opposed causes are gaining favor in the race as well. Kuczynski, a free-market champion dubbed "El Gringo," has also surged in the polls since mid-March and appears to have benefited with his announcement he was renouncing his U.S. citizenship. He has been running well ahead of the entire pack in the capital of Lima, whose streets have recently become clogged with shiny new autos from China, Japan and South Korea, all beneficiaries of free trade agreements with Peru. Humala has tried to dissolve lingering questions about his radical background. His brother, Antauro, is serving a 25-year prison sentence for rebellion and murder for leading an attack on a highlands police station in an attempt to spur an uprising against Toledo in 2005. Four police officers and two insurgents were killed. Many analysts believe Humala's close association with Chavez -- himself the instigator of a failed 1992 coup in Venezuela -- kept him from the presidency in 2006. Humala told reporters in January that he hasn't been to Venezuela since. He has instead sought advice from the Worker's Party of former moderate-leftist Brazilian President Luiz Inacio Lula da Silva, traveling to Brazil four times in the past five months. Party leader Valter Pomar told The Associated Press that while the party has been in contact with Humala, "there is nothing special about that" and it's not participating in his campaign. As for Chavez, he broke a long silence about Humala on Wednesday during a trip to Uruguay, noting that he had led a revolt against then-President Fujimori, now serving 25 years for authorizing death squad killings. "I think he was a good soldier," Chavez told reporters. Associated Press writers Frank Bajak in Lima and Marco Sibaja in Brasilia, Brazil, contributed to this report.